It has been said that necessity is the mother of invention; this is a phrase that Miss Jubilee & the Humdingers have taken to heart. The reason this band even exists is based on the “mother of invention” theory. In 2007, Valerie Kirchhoff (Miss Jubilee) noticed that St. Louis was lacking in good bands to dance to. Dan Conner, the Humdingers' current drummer, assisted Valerie in bringing together the musicians needed to form the Humdingers. This band began promoting Jump Blues music of the 40’s and 50’s but has went on to incorporate Hot Jazz & Blues of the 20’s & 30’s. On a side note, for you youngsters that may be reading this, this music was rock and roll before it was called rock and roll. Since 2007, Miss Jubilee and the Humdingers have become one of St. Louis’s hardest working bands, sometimes playing two and three shows a night, all at different venues throughout the metro area. Miss Jubilee has been on my bucket list for a couple of years now, so when I saw they were playing a free Thursday night show at Blues City Deli, I quickly clicked the 'Join' button on Facebook. With its high energy feel, Blues City is becoming one of my favorite places to photograph bands. True to form, I arrived fashionably late, as I could hear Miss Jubilee and the Humdingers' music filling the air along McNair Ave. while I was searching for a place to park. As usual Blues City was packed to overflow capacity as patrons had taken to standing in the entrance doorway to listen to the band. Miss Jubilee’s band for this show was also large with the addition of an extra horn and keyboard player, so large in fact, the extra horn player was almost playing from the sidewalk as well. One of the first things you notice when seeing this band live is Valerie’s finely-honed skills as a band leader. 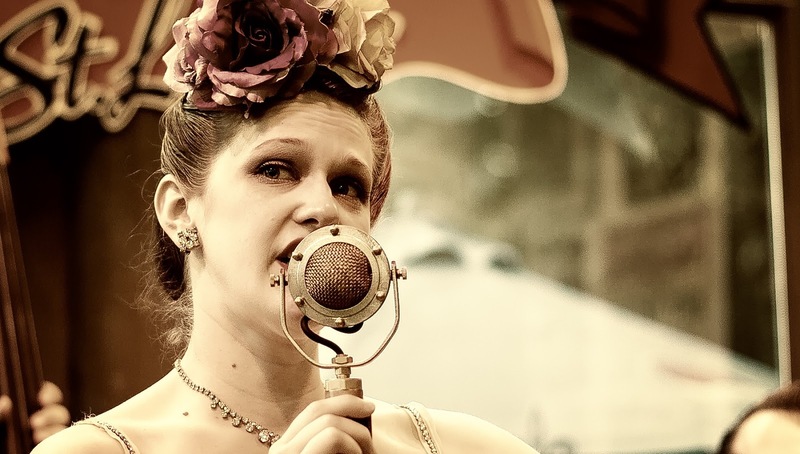 She plays the role up to the fullest by directing audience member's attentions to band members as they solo, dancing, and on this night, perusing the Blues City interior and exterior with a tip jar. All of the aforementioned talents add that extra sparkle to Miss Jubilee’s onstage charm and charisma. Not to be outdone by Miss Jubilee, the Humdingers pack a powerful, complementary punch and complete the overall sound and feel of this band.